Posted May 20th, 2015 by Joe Baldwin. Whether you have sensitive teeth, a fear of needles or harbor general dental anxiety, our Westminster office may be able to offer you a painless dentist experience. We work carefully with each of our patients to create an individualized anesthesia plan so that you can finally have a relaxing dental experience. 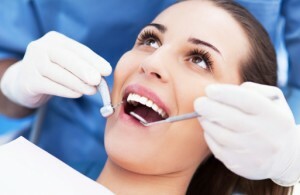 Sedation dental options can range from light to heavy and we are happy to consult with you in order to determine the most appropriate level for you. Please make sure to let your dentist know if you have dental anxiety and would like to explore your local anesthesia, nitrous oxide or general anesthesia options with our certified dental anesthesiologist. Nitrous oxide, more commonly known as “laughing gas” will help you feel calm and at ease in the dental chair. This option is often utilized in conjunction with local anesthesia, when a small area of your mouth is already numbed by your dentist, and serves to relax our patients. Periodontal Disease is the next stage of gingivitis. It’s when the plaque on the teeth has grown beneath the gum line and begins to irritate gums to the point that they separate from the teeth and create pockets that become infected. If allowed to progress from there, periodontal disease can result in more damage to gum tissue and bone until teeth become loosened and must be removed.